Want to avoid last minute mistakes when submitting your business proposal? It’s easy to forget something when responding to an Request For Proposal (RFP) as there are so many activities to coordinate. One way to ensure your proposal gets delivered on time – and with all requirements covered – is to create a checklist. Here’s a sample checklist to get you started. You can use this checklist when responding to RFPs, ITTs and RFIs. Please note that this checklist does not cover all areas (ie non-exhaustive) but will ensure that all information required by the Request For Proposal is provided in accordance with it provisions. X printed, signed and executed copies and one electronic copy of Tender Documents. Tender documents delivered to the offices of [conform that this is the correct address] by the Closing Date for Receipt of Tenders (see paragraph X). Confirmation that Response complies with National law (see paragraph X). Certificate there is no economic, legal, commercial or financial relationship with another Respondent (paragraph X). Furnished full details and identified licences, permits, permissions, including planning permission, authorizations etc required and have been obtained. Provisions of details of ownership and group structures of Respondent or if joint venture or consortium, the members thereof and, the commercial and legal relationship among the members thereof and other agreements with required confirmations. Compliance with the provision of Section X. Response completed in required format (paragraph X). Every proposal writer has different ways of organizing their bids. One thing to watch is you are responsible for delivering the response – and if you’re working with a team of writers – is to assume the something is missing. If you have this attitude, you are more likely to spot an omission, error, or discrepancy in the final document. Sometimes it looks trivial, for example, the footers may be different. Create checklists to capture before the leave your office. 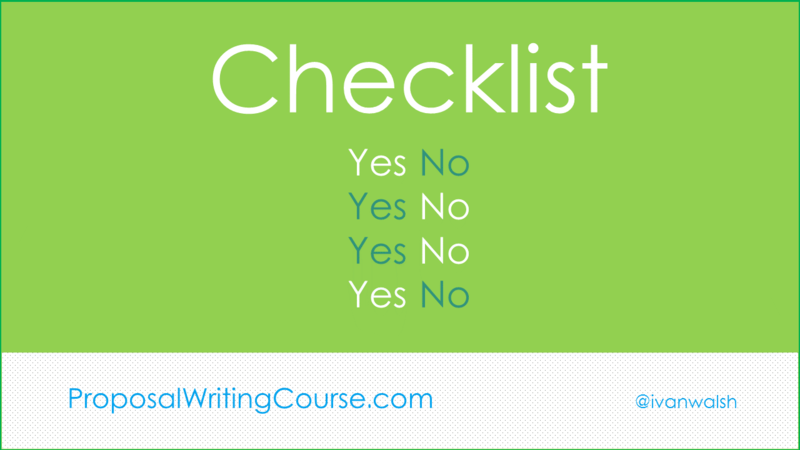 So, if you’re working later, under pressure, and coordinating many documents, use checklists to assemble the proposal correctly and make sure it gets submitted with all the relevant information.